Add anything into the fridge to shredded cabbage for a crunchy salad. Photo by Elvira Kalviste | THE NIBBLE. Some weeks, we end up having more meals out than we expected, or get shipments of perishables that we need to consume ASAP (fridge space at THE NIBBLE is always at premium). As a result, the romaine and baby lettuces we purchase for our daily luncheon salad often brown and wilt. After throwing out one head too many, we switched to bagged shredded cabbage. It’s hardier, crunchier, anti-carcinogenic and typically less expensive. And while it’s more expensive than buying a whole head, it’s easier to cram into our overstuffed fridge. We love the crunch. And, two more bonus: It’s pre-washed, and cabbage is a member of the cancer-fighting cruciferous* group of vegetables. Look through the fridge and throw in everything you have, from raw or cooked green beans. You can use a conventional vinaigrette or make a cole slaw dressing by mixing equal parts mayonnaise and white wine vinegar. And of course, you can use shredded red cabbage, or a mixture of both red and white cabbage. 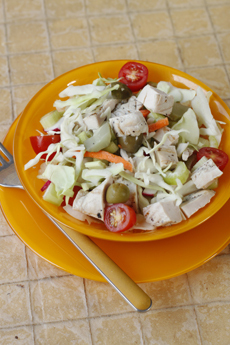 You can also turn a cabbage salad into a Chinese chicken salad with the addition of some mandarin orange segments, a sprinkle of sesame seeds and a splash of soy sauce in your vinaigrette or a 3:1 mixture of salad oil and sesame oil. If you have bamboo shoots, water chestnuts, baby corn, daikon and garlic chives, so much the better. But European cabbage has more crunch than Chinese cabbage. Find more of our favorite salad recipes. *The Brassicaceae botanical family, also called the cruciferous group, includes cancer-fighters such as bok choy, broccoli, brussels sprouts, cauliflower, cabbage, kale, kohlrabi, mustard greens and turnips, among other veggies.